Connective tissue proper: mesenchymal. Atlas of Plant and Animal Histology. Technique: 8 µm thick paraffin sections stained with haematoxylin and eosin. 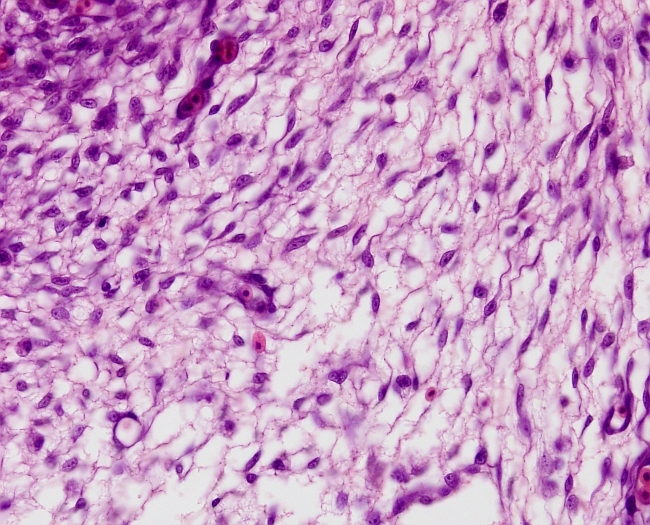 Mesenchymal connective tissue contains undifferentiated cells and a high proportion of extracellular matrix. It is clearly distinguished from other connective tissues by the undifferentiated aspect of its cells, which are known as mesenchymal cells, but also by the lack of elastic and collagen fibers during embryonic development. Later on, some collagen and elastic fibers can be found in this tissue. Cells are scattered and send thin and long cytoplasmic protrusions that make contacts between each other. The nucleus is rounded in shape with invaginated nuclear envelope. The nucleolus is usually clearly visible. Mitotic figures are also observed. In the embryo, mesenchymal tissue is initially fluid because of the importance of the ground substance (proteoglycans, glycosaminoglycans, and glycoproteins) of the extracellular matrix, but the fibrous part (collagen, elastic fibers, reticular fibers) of the extracellular matrix increases progressively during development. This tissue can be considered as an embryonic connective tissue, although it is also present in some organs of adults. During embryonic development, cartilage, bone, blood and lymphatic system, as well as connective proper, are developed from mesenchymal connective tissue. Even smooth muscle can be differentiated from this tissue.